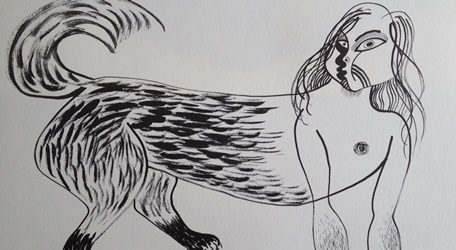 The Danish artist Aage Gitz-Johansen (1897-1977), who worked with both Greenlandic and Sami culture, drew the mythical creatures of Greenland. In these black and white drawings Gitz-Johansen plays with lines, texture, myth and fantasy. The drawings are illustrations to the book Characters of the Greenland Mythology first published in 1949 and republished in 2009. The mythological characters are primarily from East Greenland. It might not be the right term to call Gitz-Johansen’s mythological creatures for characters – they are rather figures. Figures made of lines, of surfaces and of textures. In the figures he incorporates the Greenlandic mythology and imagery with European artists’ fascination with non-western art – woodcuts, carvings and masks from outside of Europe – in the late 19th and beginning of the 20th century. Gitz-Johansen’s fascination is done with a respect and an insight into the culture he worked with. It was Knud Rasmussen – the Danish/Greenlandic arctic explorer – who encouraged Gitz-Johansen to travel to Greenland instead of Hawaii as he had planned – and he did not regret this. He travelled to Greenland nine times on shorter and longer stays. The helping spirit Tôrnârssuk is a part of this exhibition. He can walk “through mountains as if they were air; for him there are no obstacles“. This force and all these original drawings have come all the way from Upernavik Museum to support the athletes at Arctic Winter Games 2016. Enjoy!